Pork chops with mushroom cream sauce is the grown-up version of a childhood classic. OK – hands up. 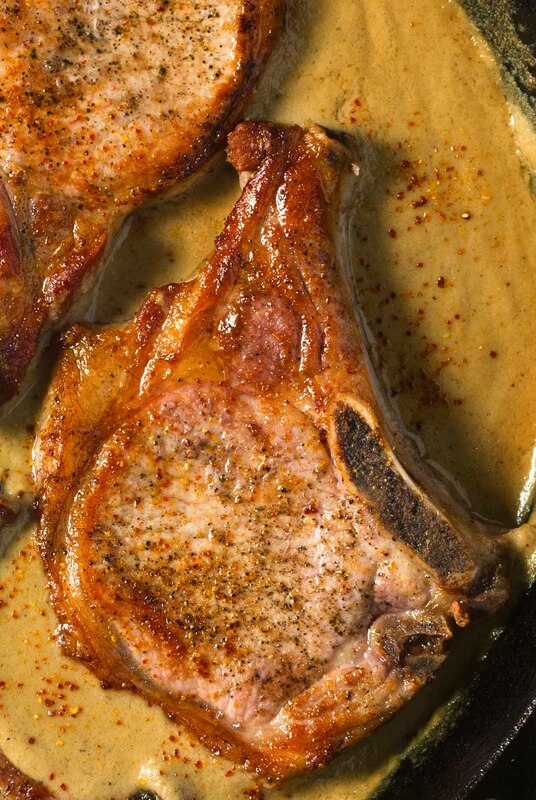 Who doesn’t love pork chops with mushroom soup? Did you grow up on it? For me it’s a childhood memory. It’s what I crave when I’m home sick. When I want to just curl up and whimper. 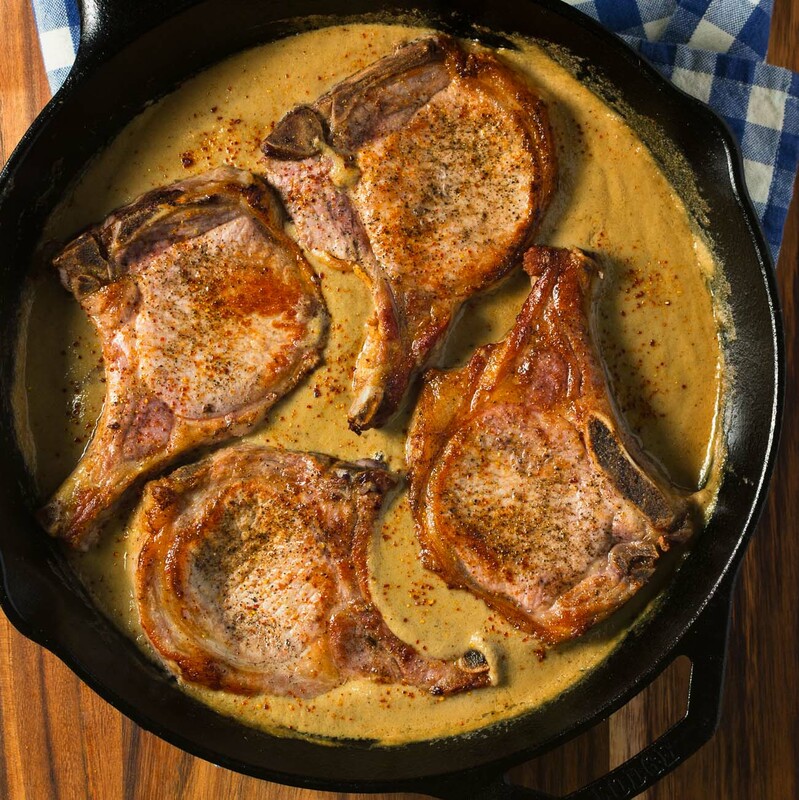 These pork chops with mushroom cream sauce follow pretty much the same recipe – just upscales it. This is the dinner party version of the Campbell soup classic. It’s rich, delicious comfort food. And it isn’t much harder to make than the 1950s classic. There’s not much to making these. The extra step is whipping up a quick “cream of mushroom soup”. Fry some mushrooms, add some liquid. Puree. Once you do that it’s the same recipe your mom taught you. Choice of pork chops is key here. Thin supermarket chops aren’t going to cut it. You need time in the oven for the Maillard flavours to develop. For the meat to brown and throw a fond. Deep flavours take time. And with pork chops time isn’t something you have a lot of. I’d say 1 inch in the minimum you can get away with here. Oven temperature is also critical. You want the juices to form a fond. Those wonderful brown bits make this dish. The flavour you get from the pan is what’s going to take this from average to delicious. You want your oven hot. 350F is not hot enough. 400F is about right. You can play with the recipe a bit too. As written it’s good. If you want it creamier, add more cream. If you want to add a bit of spice, piment d’esplette is really nice. If you want to go crazy truffle salt or oil takes it to a whole new level. That’s serious dinner party fare. 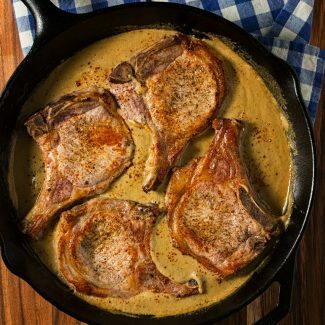 Pork chops with mushroom cream sauce. Not your parent’s pork chops with mushroom soup. But not so different either. Like you remember. Only better. Pork chops with mushroom cream sauce. It's a grown up version of the Campbell's soup classic. Pre-heat a pan large enough to hold the chops in one layer. Add 1 Tbsp butter and 1 Tbsp olive oil to the pan. Saute the mushrooms and shallot (or onion) until the mushrooms are cooked and lightly browned. Add the wine or sherry and reduce until reduced by 2/3. This should take 2 or 3 minutes. Add the thyme and 1 cup chicken stock, reduce heat and let simmer for about 15 minutes. If the pan dries out add a bit more chicken stock. Remove the sprig of thyme then puree the mushrooms in a blender with enough stock to get it to puree. You may or may not need to add a bit more stock. It depends on how much evaporated during the simmering phase. Wipe out the pan. Return to medium heat. Season the chops with salt and pepper (or just pepper if you pre-salted them). Pan fry the pork chops until nicely browned, about 2 minutes. Flip the chops and place them in the oven to roast until done. You are shooting for an internal temperature of about 145-150F. Remove chops from the pan and tent with foil. Heat the pan and everything that's in the pan over medium heat. Add the mushroom puree and scrape up any bits. You want all the pork goodness in your sauce. Add the cream and stir to combine. Mix in a pinch of cayenne and salt to taste. Finish the sauce with a few drops of truffle oil or salt if you have it. A sprinkle of piment d'esplette is a nice touch if you have that too. Truffle oil is not essential but it's very good in this dish. In american, french, main course, meat, pork. Bookmark the permalink. Oh my gosh!! This is a childhood classic for me. This was what dad use to make for me all the time with Campbell’s cream of mushroom over a bed of spaghetti! Haha this is definitely an awesome and modernized recipe that is screaming to me to make it!! Such comfort. I’ve never had pork chops with mushroom soup! And I feel I’ve missed out because this version looks divine. The sear on that chop is perfect and I’m sure bone-in chops keeps in nice and juicy. Thank you for catching this Susan. It goes in after you saute the mushrooms. I’ve corrected it in the recipe above. I added extra cream for more sauce, used boneless pork chops, panko bread crumbs and cooked the chops on the stove.